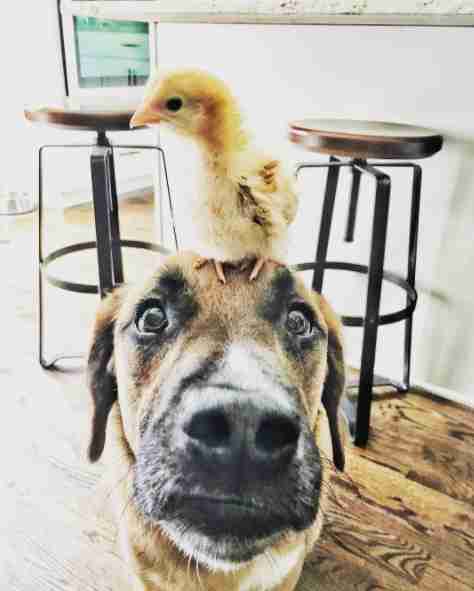 When Brittany Gillott brought home six baby chickens, her dog Mac fell head over heels in love with them. 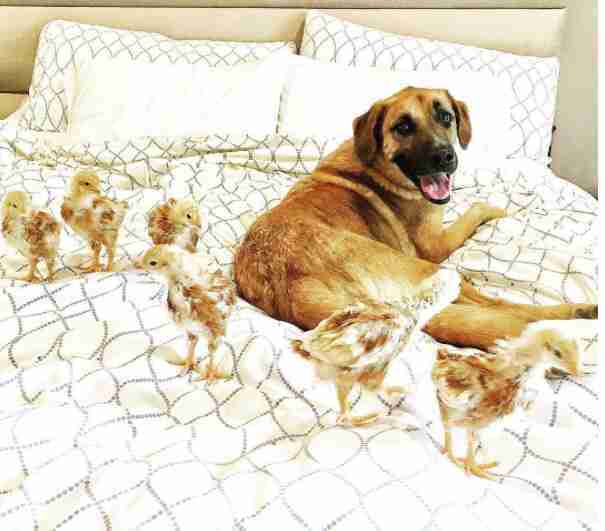 In fact, he seemed to decide to be their mom. 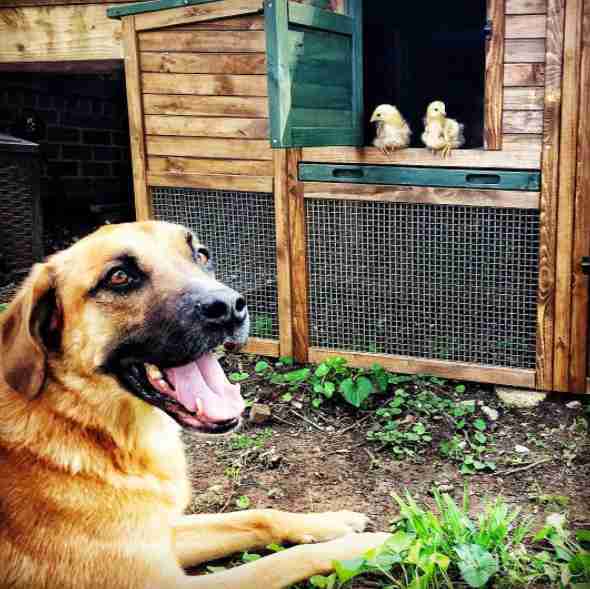 Gillott and her husband adopted Mac four years ago from Love At First Sight, a rescue group in Nashville, Tennessee, and they knew he was a sweet dog from the very beginning. 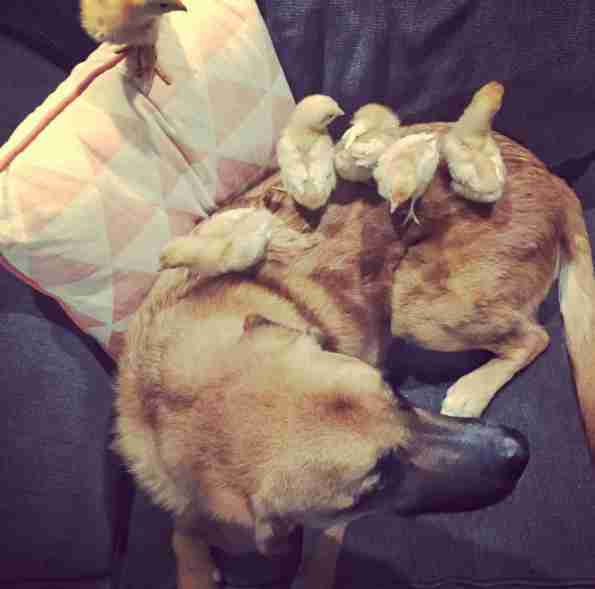 Mac might be sweet around other dogs, but Gillott didn’t know how he’d act around baby chickens. 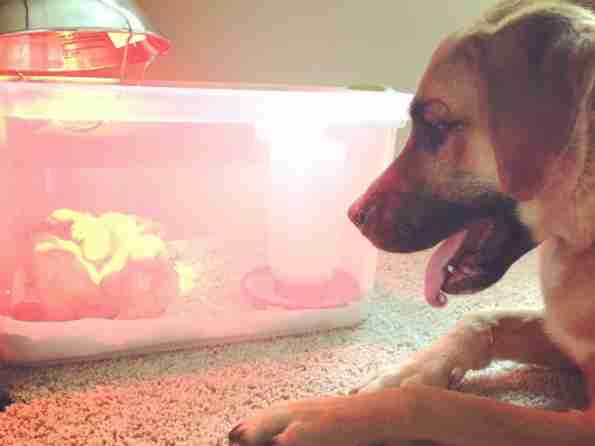 To play it safe, she kept the chickens in a room inside the house that Mac couldn’t get into. Mac, however, wanted to do things differently. He nudged his way into the room, and then he’d sit on the floor and gaze at the chickens through the clear plastic bin that acted as their enclosure. 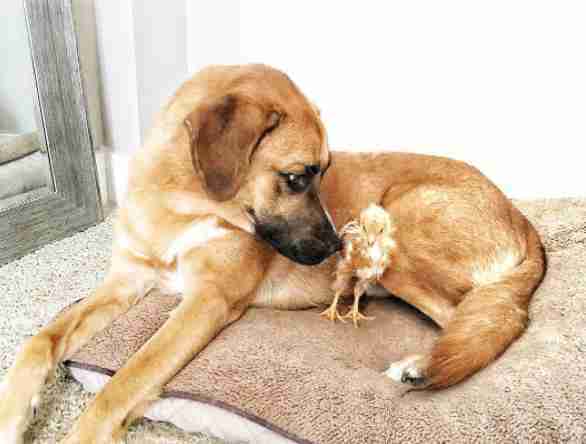 Soon Mac became obsessed with the baby chickens, and he insisted on seeing them each morning before he even ate his breakfast. 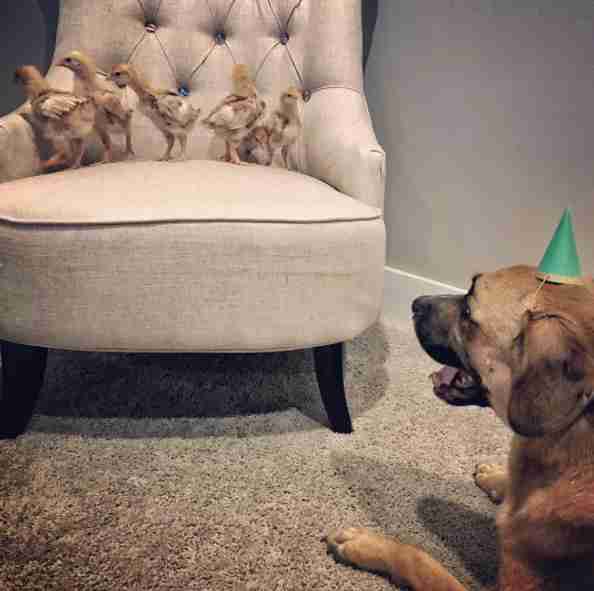 Visits with the chicks quickly became part of Mac’s routine. 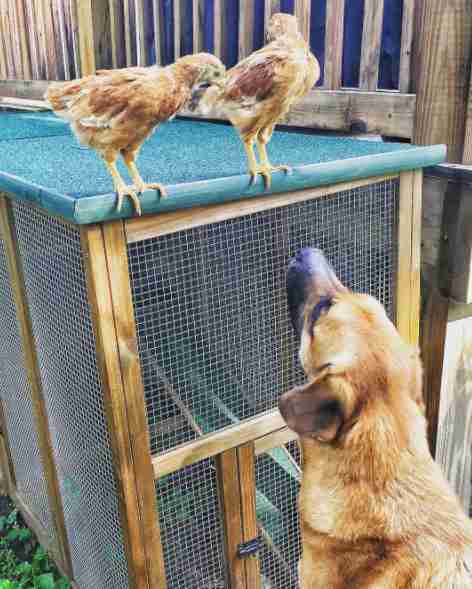 When the chicks got a little older, Gillott still remained cautious, and she’d supervise any interactions between Mac and the chickens. But Gillott quickly realized that she had nothing to worry about. “We’d take them out for a few minutes at a time, so he could get used to being around them, and he would just wag his tail and sniff them, and he’d let them run around him,” Gillott said. 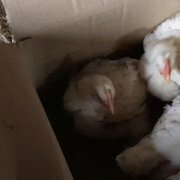 The chickens are older now, and they now live inside the garage and have free access to the yard, herb garden and deck area outside the house. But Mac continues to look after them like a proud and protective mom. 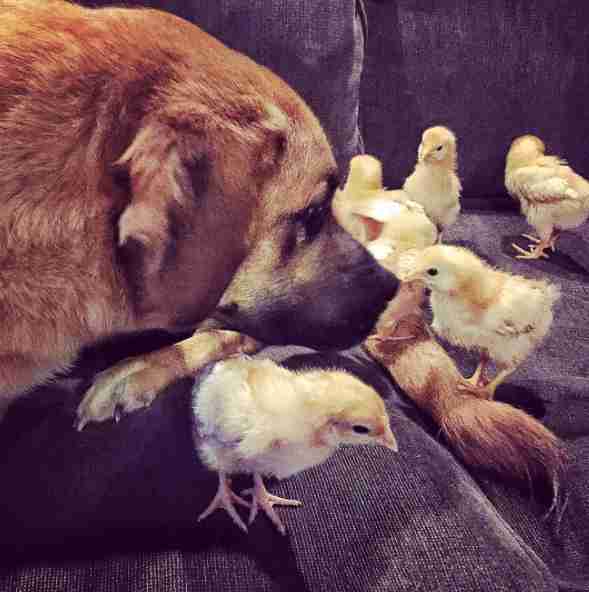 To see more photos of Mac and the chickens he loves, follow their Instagram page.